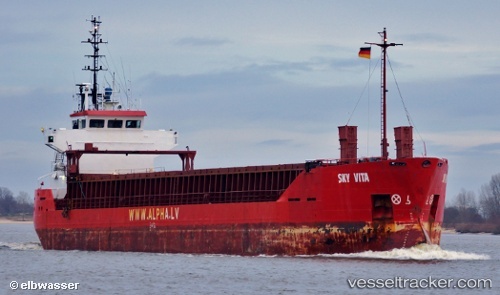 On May 17, 2018, the "Sky Vita" was towed into the port of Rotterdam by the tug "Sky Vita" as dead ship, bound for the Waalhaven. The transport was assisted by the Kotug Smit tug "Experience". The ship which had sailed from Puerto Marin on May 9 was moored in the northern Waalhaven at 5.15 p.m. She sailed again on May 25 at 7.25 a.m., bound to Hamburg, ETA May 26, 6 a.m. In the foremidday of Sep 4, 2017, officers of the water police found during an inspection in the Kiel Canal locks in Brunsbüttel that the "Sky Vita", enroute from Södertalje to Motril, ETA Sep 12, was being overloaded. The loading marks were under water when the ship entered the northern lock at 11.30 a.m. The draught was found to be 6,5 centimeters too much which was equivalent to 68 tons. The ship was detained by the relevant authorities and dropped anchor on the New Western Neufeld Roads on the Elbe where the draught was corrected by three centimeters by pumping out ballast water. Sewage water of 12 tons had to be disposed of on sea. The ship was released at 2.25 p.m.The Latvian captain was facing a punishment and had to pay a safety deposit of 1300 Euro.